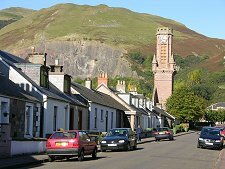 All of the Hillfoot villages which line up along the base of the southern edge of the Ochil Hills owe at least part of their development to the textile industry. This is especially true of Tillicoultry which grew where the Tillicoultry Burn emerging from Mill Glen could be harnessed to power woollen mills. The town owes its name to the Scottish Gaelic for "hill in the back land" and in 1195 it was recorded as Tulycultri. You could assume that the name simply refers to the presence of the Ochils, looming high above the settlement. More specifically, some feel it refers to the topography of Mill Glen, which leads into the Ochils before dividing to pass either side of the distinctive hill known as The Law. 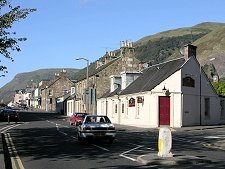 The origins of the village lie in the area known originally as Westerton, where the old road to Stirling crossed the Tillicoultry Burn. 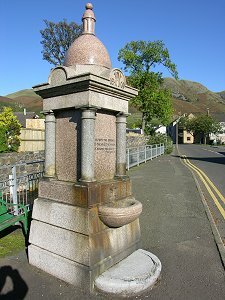 From the early 1700s Tillicoultry became known for Tillicoultry serge, a cloth manufactured by weaving worsted with linen, though in 1790 it remained a fairly small village. This all changed following the establishment of the first mill in the 1790s, which was rapidly followed by many more. The first mills were water-powered and built close to the burn, but from the 1830s steam powered mills began to be introduced. These spread steadily south west down the Tillicoultry Burn as prime space was used up. The impact on the town was dramatic. A population which stood at 916 in 1801 had increased to 4,686 in 1851. Tillicoultry serge continued to be manufactured in the town, but many other product also emerged from the mills here. These included blankets, plaids, tartans, tweeds and shawls. To serve the industry a branch railway from Alloa arrived in Tillicoultry in 1851. By 1870 there were 12 mills employing over 2000 people on 230 power looms and 340 hand looms in Tillicoultry. In addition there were some 200 hand loom weavers making shawls and napkins in the town. A surprisingly large number of the town's mill buildings are still on view. 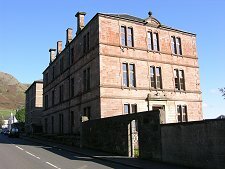 Some, like the J&D Paton's Mill in Lower Mill Street, have been converted into housing, while others have become offices. The huge Devondale Mill was already out of production by the First World War, when it served as an army barracks with some 800 horses stabled on the ground floor. It later became a paper mill. 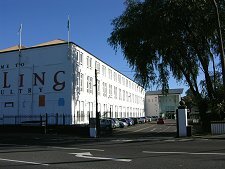 It is now the home of Sterling Mills furniture warehouse and retail centre. Tillicoultry itself developed on an oblique grid pattern. The old main road lay close to the foot of the hills, while the more modern one lies a little way south of it. Between them are a series of diagonal streets lined with millworkers' cottages. The most attractive of these is Ochil Street. 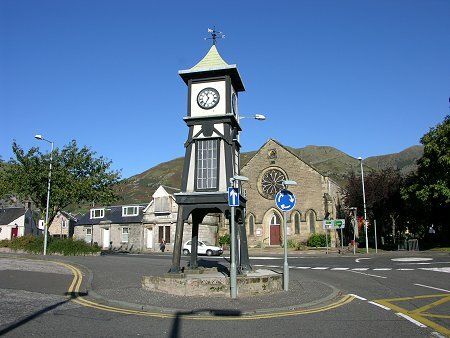 This comes complete with a free-standing tower built in 1879 as a bell tower for the (since demolished) Town Hall. A slightly more modest tower was built in Murray Square in around 1930 (see header photo). 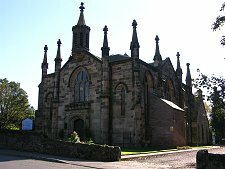 This formed part of one of Scotland's first dedicated bus stations, built here to reduce the number of accidents arising from the eight bus services which terminated in the town at the time - a total of 334 services per day. The bus station remains, but a small reading room built nearby in 1936, the wonderfully named Thomas Murray Howff for Aged Men, was demolished in 2001.